Disney Orlando and the LOBO System. Steam Tunnel laundry systems need repairing, modifying and rebuilding due to constant use and yet must be available every day to carry out heavy workloads. The troubleshooting of electrical, electronic and pneumatic controls, rebuilding pumps, valves and regulators are all standard daily maintenance tasks. Laundry Steam Tunnels are tunnels filled with steam which is blown by a large squirrel fan driven by an electric motor at the top of the unit. The purpose of such a device is to give garments made of a mixture of poly and cotton fibres a ‘pressed’ look without actually having to press them. A Steam Tunnel can process hundreds of garments and uses an assembly line process. The garments are hung on a conveyor belt that takes them through a steam-filled tunnel heated to the correct temperature to bring about relaxation of the fibres within the garment and eliminate any wrinkles. The top of the Steam Tunnel is not normally load bearing and has no edge protection system, and access to service the top of the Steam Tunnel is required to perform preventive and corrective maintenance and so a safe system needs to be put in place to resolve these issues. 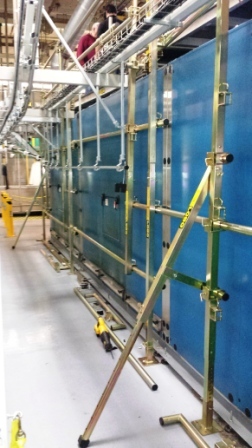 The LOBO System is a work platform scaffold product that combines the flexibility and strength of traditional scaffolding with the simplicity and mobility of tower systems, but is much more versatile, and no assembly tools are required. It can be made into any shape or size and is perfect for maintenance and production applications. The LOBO System flat packs for transportation & is easy & quick to erect, versatile and strong. Options include an integrated sliding lifting beam and the TowerStore, a secure storage unit. 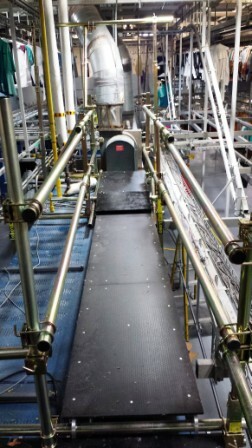 Your own maintenance crews can assemble the system quickly and safely around, under or above machinery, vessels or conveyors and specifically in restricted areas. Your maintenance tasks can be better controlled and out sourced scaffolding labour costs can be reduced without compromising safety. 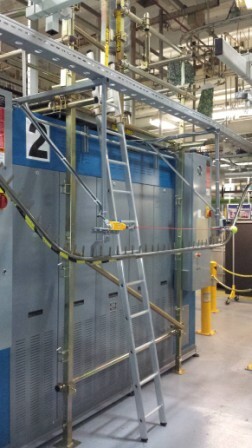 The LOBO System can be configured to meet these requirements, produce a work platform for safe access to the top of the Steam Tunnel and provide an edge protection system around the top perimeter. The LOBO System can be adjusted and bespoke designed to access side panels on the tunnel. Lint which needs to be removed every 3 hours prevents the necessary cooling and this could create a fire hazard if not dealt with properly. The electric motor requires inspection every 2 weeks and may need to be removed every 6 weeks, for closer inspection. The LOBO Lifting Slider Beam can be configured and an integral feature to provide the lifting solution. Australia: AS/NZS 1576.5:1995. AS/NZS 1576.3:1995 Tower.